Circa 1999- By any technical standard, this is a terrible image. It is out-of-focus, features muddled composition, is poorly-lit, and so on and so forth. Yet, this weak image captures a special moment snugly wrapped in a unique life experience. Most of my visual memories prior to 2004 can only be directly shared through poor pictures like this one. During my college summers, I wound up teaching English in two cities in China not named Beijing or Shanghai. Those are of course wonderfully vibrant and important cities, but I appreciated getting to know slightly less developed parts of the country. China was also much less open in those days, and the trips represented an opportunity to explore a fairly unknown place. 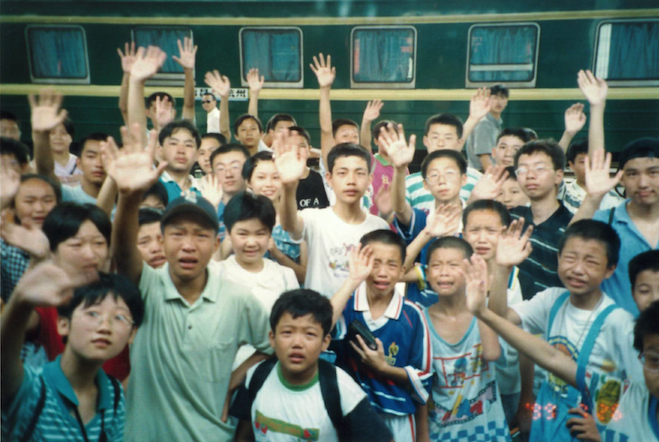 And what a magical journey it wound up being- filled with 48 hour train rides (Jiangxi to Liaoning), living out of a single suitcase for 2 months, exhilarating but dangerous bicycle rides surrounded by my students, an entire summer with a host family that spoke zero English, and just spending time with my fellow teachers and students. I used to ask 3 different students to come in a little earlier each day to teach me Chinese, which was really a delightful win-win- the kids liked being my teacher and I liked getting to know them better and picking up some conversational Chinese. The stories from those summers could fill countless pages. So at the end of my journey, I took 8 or 9 rolls of film and dropped them off to be developed. I am sure there were many interesting (of equally poor quality) photographs, yet this is the only one that has stuck and that I have always carried with me from place to place. In part inspired by this amusing story (How I Became a Minor Celebrity In China- a continuation of who is this man and why are his photos showing up on my phone), I would love to somehow connect with my old students from the cities of Nanchang and Panjin. Perhaps the serendipitous internet fairies will be kind to me. Any and all leads would be most welcome. Looking for needles in a billion+ sized haystack? Perhaps.